Written Area: b) 95 x 26mm, 93 x 33mm, 100 x 45mm, 94 x 31mm; c) 285 x 94mm. Number of Lines: b) 31, 30, 13+13, 31; c) 73. Line Height: b) 3mm; c) c. 4mm. Rubrication, come bookworm damage, and lead line rulings on b). Littera Gothica Humanistica for b). Gothica Documentaria Cursiva for c). 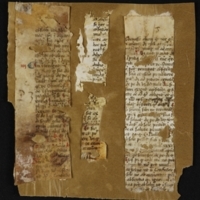 Content: b) contains a Manual for Confessors - fragment 1 mentions the Articles of Faith and the Decalogue, the sins of avarice, gluttony, and wantonness; fragment 2 mentions the sin of envy; fragment 3 mentions confessor; fragment 4 includes "to have a cleric beaten" verberasse clericum, "he should demand of a person making a confession" exigat a confitente, "by/from a sole penitent" ab solo penitenti "he/it can be absolved" potest absolui. c) contains part of an unidentified document. Have Colker's notes. 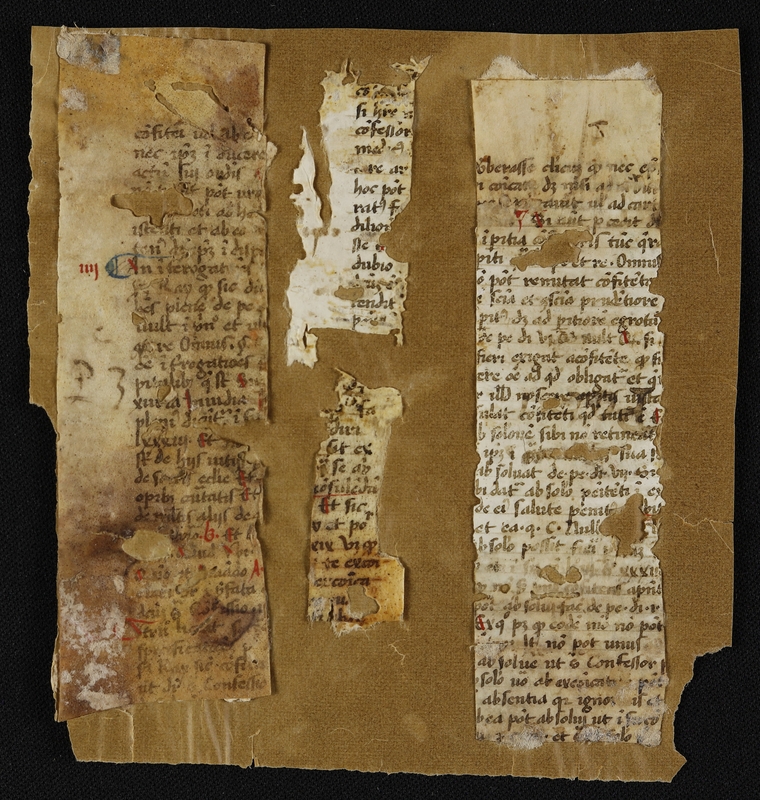 Physical Size: 5 parchment fragments (b. 116 x 27mm, 110 x 34mm, 92 x 19mm, 107 x 31mm; c. 300 x 94mm). 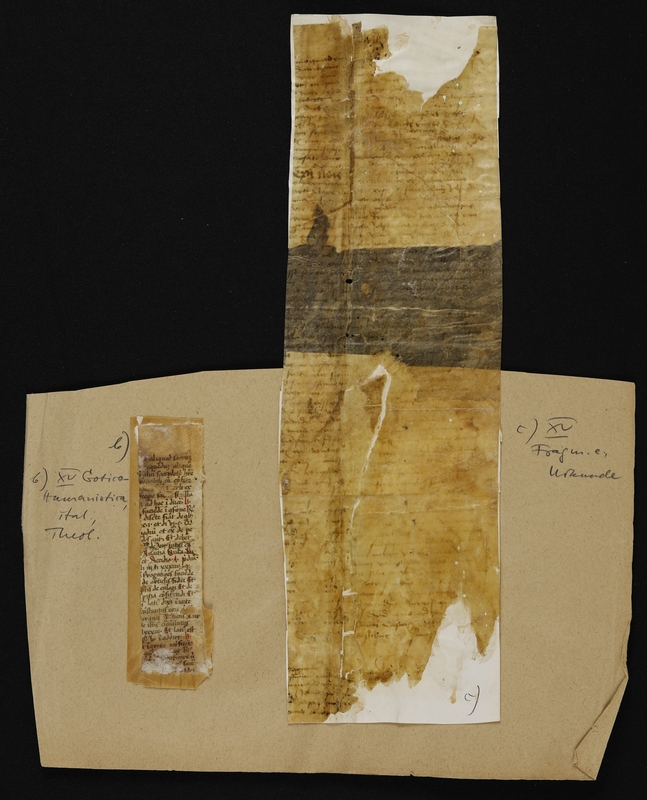 b) originally glued to white paper, then to brown paper (146 x 120mm), which has completely broken away at the right hand edge of the first fragment. c) is glued to white paper, lined on one side (305mm x 96mm). 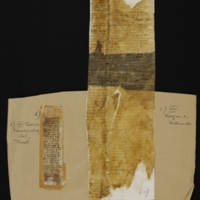 The first fragment of b) and all of c) is then glued to a piece of brown paper (264 x 176mm).